Can I post one final ode to summer? Because, I’m going to. One of our favorite places on island is The Juice Bar. It’s located right on Broad Street, just steps from the ferry, and is the ONLY place on island at which it’s worth buying ice cream. They make all their ice cream there and it’s to die for. They also make ridiculously good brownies, cookies, and waffle cones, and make to order fresh juices and smoothies. They’re going to close for the winter this weekend, and we’re really sad. But that sadness might have been a good thing, because it prompted me to get out our juicer and blender and try my hand at replicating Chris’ favorite thing on the menu: the watermelon cream. 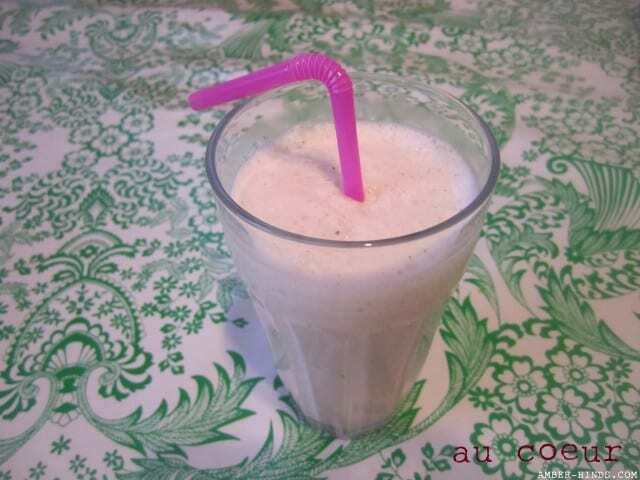 Basically, this is a vanilla milkshake made with watermelon juice instead of ice cream. I don’t know if The Juice Bar invented this, but it’s amazing! My version, at home, was pretty fabulous too, so I had to share. If you don’t have a juicer, you might be able to buy watermelon juice or you could just blend cut-up watermelon with the ice cream. I didn’t get much pulp when I juiced it, so I don’t think the watermelon chunks would be that noticable in the final product. – 1 small watermelon, or enough to make 2-3 cups juice. I’ve found that 1lb watermelon (weighed with the rind) usually results in 1 cup juice. Cut watermelon into chunks small enough to put through juicer. Juice enough watermelon to make 2-3 cups liquid. In a blender, add 4 cups ice cream and 2 cups of the juice. Blend to combine, adding enough of the remaining 1 cup juice to get to your desired thickness. Pour into cups and enjoy! Makes approximately four servings…or 2.25 if you’re us. I pureed watermelon and froze it in an ice cube tray to give to John. However, they were so yummy in place of regular ice cubes that I used them all. They were especially good in pink lemonade. I’ll have to try my hand at a “watermelon cream” sometime. Mmm, watermelon ice cubes sounds delicious! Last summer, before we have a juicer, we used to freeze watermelon and blend it with milk, a little sugar, and vanilla. Cheater watermelon creams!